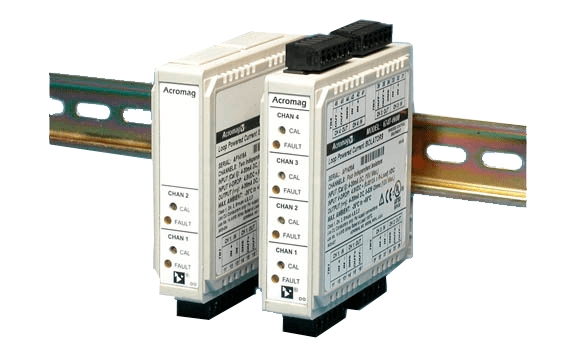 These units receive 4-20mA process current inputs and provide isolated 4-20mA output signals . Each channel operates independently and is isolated from the others to prevent interaction between channels . • Multiple channels on a single unit space and reduces costs . • Galvanicc isolation eliminates ground loops, reduces noise, and blocks transient signals . • Independent channels prevent signal interaction and offer spares for later use . • Fault LEDs provide a clear visual warning of open or failed process loops . • Single calibration pot per channel enables one-step, precise calibration . – 4 to 20mA input (each channel) . – 4-20mA DC output (each channel) . – 0 to 525 ohms . – Better than ±0 .1% of output span .Error includes the combined effects of isolator repeatability, hysteresis, terminal point linearity and adjustment resolution . – One 15-turn potentiometer per channel accessible from front of the unit . – Less than ±0 .01% of output span per °F (±0 .018% per °C) over the ambient temperature range for reference test conditions .This specification includes the combined effects of zero and span over temperature . – Less than ±0 .1% of the maximum output span . – -3dB at 2 .2Hz, typical . – For a step input, the output reaches 98% of output span in less than 300mS, typical, into 250 ohms . – Common mode: 110dB at 60Hz, typical . – LED fault indicator: Lights for output open loop detection or load compliance problem . current during field maintenance with a voltmeter . – Operating: -25 to 70°C (-13 to 158F) . – Storage: -40 to 85°C (-40 to 185°F) . – 5 to 95% . – Power is derived from the input signal loop . – In the event of an open output circuit, the input loop voltage drop is limited below 20V, nominal .Isolator has reverse polarity protection . – Inputs, outputs, and individual channels are isolated from each other for common-mode voltages up to 250V AC, or 354V DC off ground, on a continuous basis (will withstand 1500V AC dielectric strength test for one minute without breakdown) . and European Norm EN50082-1 . solenoids, commutator motors, and drill motors . -Complies with EN61000-4-4 Level 3 (2KV) and European Norm EN50082-1 . - Complies with EN61000-4-5 Level 3 (2KV) and European Norm EN50082-1 . – Meets or exceeds European Norm EN50081-1 for Class B equipment . – CE marked, UL & cUL listed . – Hazardous Locations: Class I: Div .2; Groups A, B, C, D .
Optional terminal block kit, barrier strip style, 4 pcs . Optional terminal block kit, spring clamp style, 2 pcs . (For use with 671T and 672T model .s). Optional terminal block kit, spring clamp style, 4 pcs . (For use with 674T model ). DIN rail strip, Type T, 3 inches (75mm) or 16 .7 inches (425mm) 20RM-16-DIN 19” rack-mount kit with DIN rail .